An online digital transcript and credential exchange service has added an additional feature to its college search capabilities that allows a student, parent or advisor to see comparable schools that may be worth applying too as well. 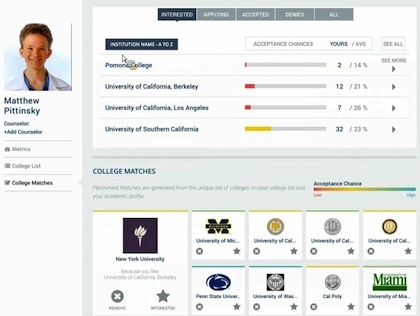 College Match is the latest of several data-driven tools Parchment provides free to help students make more informed decisions during college selection. The company's primary business is a transcript management service that lets students arrange to transmit their transcripts to prospective colleges and universities. According to CEO Matt Pittinsky, Parchment works with 400 post-secondary institutions representing about 10 percent of all enrollments in the country and about 15 percent of American high schools. Students can set up a transcript management service that lets them order transcripts from a high school or college, track the status of delivery, and arrange to send it to any destination worldwide. The company's business model generates revenue from three possible directions. It may charge the student to deliver the transcript. State education agencies or individual schools or institutions may have a subscription to the service that allows students to distribute transcripts free. And it provides premium services for schools receiving the transcripts, such as automatic routing or data integration with existing admissions systems. Parchment's College Tools are publicly available; however, people who register for the service can personalize the results of their queries. The student must enter contact information, reported and unweighted grade point average (GPA), current grade level, state of residence and GPA and SAT/ACT scores for math, writing and science, as well as a list of college preferences. When a student specifies a specific institution of interest, Parchment automatically takes data in his or her profile and calculates the odds of admission. Parchment's new College Match tool recommends institutions students may want to apply to and provides odds of admission. "Because we have a lot of data about students — where they've applied, where they've been accepted and waitlisted and where they chose to go — we can develop statistical models for each of the institutions in our database that predict how likely you are to be accepted," explained Pittinsky. "For colleges that are generally accepted on factors we can observe — SAT or GPA — these predictions are very accurate and can be really helpful." He noted that for institutions where acceptance is based on many other non-numeric factors, the site provides a "confidence level" rating to communicate how helpful Parchment considers its predictions. The new matching tool takes the list of schools of interest pulled together by the student and runs an analysis to recommend additional schools the student can apply to with "better confidence of the overall outcome." It also addresses a current quandary. "The admissions market is becoming more national," Pittinsky said. "Students who used to apply relatively locally are applying across the country. That means you and your guidance counselors need to be aware of a much broader set of options than historically they have been." The analysis takes into account factors such as the type of institution already on the list — private, public, for-profit — as well as the student's odds of admission. "We're generally recommending schools that you have a middle to good chance of being accepted to," noted Pittinsky. When the new list is compiled, the student can choose to run a new simulation to generate an updated prediction of success. Pittinsky compared it to a stock portfolio. "It's not about whether any one stock performs; it's about how stocks perform in general. Now I have a 90 percent chance of getting into at least one college on my list." The data used for analysis is made available through opt-in. During registration for the tool, a popup asks students if they'll allow their data to be used for the purposes of college matchup. "To be clear," said Pittinsky, "none of this [data] comes from our schools' databases or from exchanging transcripts. What this is about the individuals who come to manage their transcripts on Parchment going one step further and crowdsourcing this information to the benefit of all." "Our new online tool helps students broaden their horizons to discover and find these exceptional alternatives to build a balanced application list, thus increasing their chances of getting into one or more favorable colleges," he added. "Students should know there are a number of exceptional colleges to consider around the nation. While elite colleges are becoming more selective in their admissions process, College Match is a great resource for students in exploring new comparable options."